A tall fence surrounds the old Tannery Grounds out at Orchard st and River st, but the wildflowers spill out and press close to the pavement. Cottontails scatter as we approach, and birds are greeting the dawn from the welcoming branches of a big White Oak. On the fence there are several “No Trespassing” signs, but where River st approaches the water, a well-travelled trail enters the Tannery Grounds through a deliberate gate. There was once a tannery here that leaked its poisons into the soil for decades, and hazardous waste continued to be dumped here even after the old tannery was torn down. The popular story is that the Tannery Grounds are poisonous, unsafe, and need to somehow be dealt with. This story keeps most people away, and it has meant that, for the past forty or fifty years, this site has been rewilding on its own. Our first steps through the gate immediately reveal the richness of what has come to be out in this forgotten corner of Kingston. Inside the fence, we rest in the welcome shade of a dense thicket. The thicket community here is characterized by small quick-growing trees like Staghorn Sumac and Manitoba Maple. They form a canopy over the Golden Rod, Fleabane, and other wildflowers that would have been among the first plants to return to this site, stabilizing and enriching the soil until larger trees could get established. The process by which the first species to establish themselves in a brownfield develop into a thicket is called succession, and it means a steady increase in biodiversity and health. The eager plants in this thicket represent an early succession community. They build up the soil and create habitat for the birds and mammals who bring the seed for the next stage of succession. Often times, these kinds of thickets are dismissed as valueless, “just a bunch of weeds”, when really, they are doing important front-line work in healing the most damaged of lands. As we dig into the thicket, we find young Red Ash, Silver Maple, Red Oak and White Oak – all species that would be found in a more mature forest. We also find Hawthorns just setting fruit, Red Elderberry growing above its good friend Wild Strawberry, and a stand of enormous Black Willows leaning over the shore of the Cataraqui River. In their shade, we watch a blue heron hunt and look out across the water at a strange horizon of wind turbines. Kingston is trying to style itself as “Canada’s Most Sustainable City”. This seems to be mostly a matter of calling the city sustainable so often that people believe it to be true. The wind turbines on the far shore mostly makes us sceptical of the city’s claims, because the city is also planning to destroy this healing forest for a new road, the Wellington st extension. We wonder why their vision of sustainability includes costly and uncertain technological fixes like wind turbines, but ignores the ability of land to heal itself. The Tannery Grounds are huge, and there is so much life and growth around that we could easily spend all day exploring just in this one spot. But the thicket is only the first of three distinct ecosystems that make up this healing land. Just beyond the Willows, there is a fork in the trail. To the left, there is a meadow that is still dealing with the most recent disturbances to this site; to the right, there is a marsh thriving on the fill left from this land’s industrial past. Going left towards the meadow, the thicket ends abruptly at a series of tall, dry, gravelly hills. As we scramble up them, we quickly realize that these hills are mounds of soil from other sites that were brought here to be dumped. As we climb and descend, we notice that plants like Goldenrod, St John’s Wort, and Bouncing Bet stick to the less exposed, low places between hills where water collects. But even on the scorched, compressed tops of the dump piles, we find a few brave Thistles, with their creeping underground stems, and Mullein, sinking their long tap roots down, stabilizing the soil and making way for more life. Just beyond the dump meadow, there is a row of Sumac and Buckthorn separating it from quite a different meadow. This one is characterized by the bright yellow flowers of mustards working to clean up lead and chromium from the soil, and huge Cottonwoods, whose roots help to contain toxic groundwater. The two fawns pause to consider us before following their mother into the low shelter of the Sumac grove. Meandering along deer trails back to the willows, we choose the other fork now towards the third ecosystem in the Tannery Grounds – the marsh. There, stands of Cattail spill out flocks of Redwing Blackbirds, and frogs leap from the gravel path to hide among their roots. Marshes once defined much of the shores of Lake Ontario. 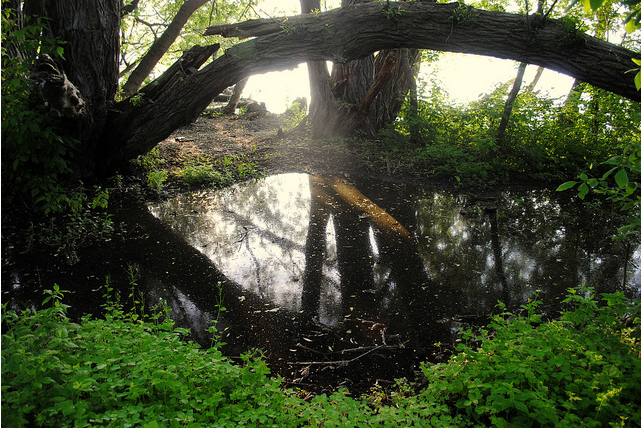 More than two-thirds of wetlands in Southern Ontario have been destroyed. The shore here was filled in with gravel to remove the original marsh and make the shoreline straight and regular. That this particular industrial landscape has restored itself is a powerful inspiration, even as it sits between a golf course to the north and a leaking sewer plant to the south. We sit among the Heather and watch White Water Lily flowers catch the morning sun. A group of turtles slide from a log back into the water, warned of our approach by the birds’ warning calls. The plant and animal communities here are enriching the soil and cleaning the water; this makes space for the return of the fungus and soil microbes that can break down and digest the toxins in the soil. Their actions provide the nutrients that can support even more plants and animals. Just thirty years ago, this site was so poisonous that guard dogs suffered chemical burns on their paws. Within just a few decades though it has grown to become a model of health that more people in Kingston will hopefully take the time to explore and celebrate. We must question the logic offered by local politicians that sustainability means looking at windmills out the window of your car while taking a newly built shortcut to the highway. The Tannery Grounds also show us that, more fundamentally, we need to ask if it is really politicians and business owners who have the best answers for dealing with the toxic messes they have created. The Knowing the Land is Resistance Collective stopped in Kingston on July 17th for the first workshop in our Seeds of Resistance tour. We gathered with nine excellent locals at the Artel, a collective house, gallery, and social space. The struggle to defend the Tannery Grounds is just getting started, and we’ll be sure to post more news as it emerges. interesting.. I agree that the tannery lands are beautiful and seem to be regenerating, but they’re also fully serviced (water, sewer, transportation, etc.). To achieve sustainability it’s important to concentrate development in serviced areas, rather than letting development sprawl across the landscape. I would suggest that there are better places in which to protect forested lands. One of the big lessons of the Seeds of Resistance tour for us was that every piece of land is worth fighting for. Every bit of land, whether it’s a pristine parkland, a toxic former industrial site, or your own front yard is equally important to the health of the whole watershed we live in. There aren’t better places to protect, just more politically convenient ones. Everyone who lives on the Great Lakes benefits from that stretch of shoreline on the Cataraqui healing. Who would benefit from developing it? We’re just posting an article now that touches on Diana Beresford-Kroeger’s (Kingston-area writer!) idea of the bioplan as a way of integrating human habitation with increased wild health and biodiversity. We would offer this as an alternative to the ideas of development that are being discussed for the Tannery Grounds. And at the risk of being cheeky, the Tannery Grounds are developing… into a forest! hey again! your question about who would benefit from developing it was probably rhetorical, but I would argue that the people of kingston would benefit. we’ve identified a great need for affordable housing that’s a walkable distance from commercial centres, as well as a need to maximize the use of existing infrastructure which is extremely costly to maintain long-term. it’s not about political convenience so much as about good land use planning. Marshlands need to be saved,the small forest beside the tannery site actually buffers and protects this vital wetland!If you develop near there wildlife would be impacted!.P.G. You make a good point. Whatever the arguments in favour of urban densification, building on the Tannery Grounds takes away land that is open to everyone — including turtles, migratory birds, and willow trees, and transforms it into a commodity available only to those who can afford it. And the link you make between income and access to wild space is an important one — where are the affordable neighbourhoods in Kingston? What kinds of wild space exist there? What are the other environmental factors of that neighbourhood (eg, pollution, access to healthy food)? It’s an amazing bit of luck for people in Kingston to have as vibrant a wild space as the Tannery Grounds right in the core of the city. You’re right to ask why a police station or a stadium are valued more highly than a wetland or healing forest. If it was valued as it deserves to be, this supposed need to “develop” it would disappear. Judging by the article and the comments it sounds like not a single person opposes destroying those healing lands that you wrote about. I wonder if there is any resistance? Has anyone been there lately? Went for a trek through yesterday… It is not what everyone remembers. It is now an abandoned homeless community. Tents, camp stoves, couches and still people living in there. Clothes hanging to dry in the beautiful sun yesterday. It wa eary and eye opening. Seeing what once was a community for people who had no where to go, and then they all vanished. Looks like something out of the walking dead. i lived in Hampton wick when the tannery was in operation .down by the river i loved the smell of the leather .